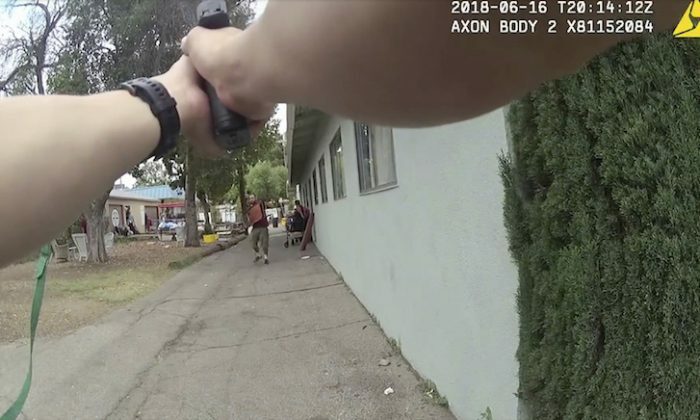 LOS ANGELES—Dramatic video released Tuesday shows Los Angeles officers fatally shooting a man and the woman he was holding with a knife to her throat, the first of two recent killings of hostages or bystanders as police tried to stop attackers. Officers opened fire outside a church that helps homeless people after the man began cutting the hostage, police said. Officers fired nearly 20 times on June 16, and the man and woman, both transients, died at the scene. “This is another case where officers were forced to make split-second decisions based on the actions of a violent individual,” Police Chief Michel Moore said. The second such fatal shooting came just five weeks later when police tried to stop an armed man from entering a Trader Joe’s store and fatally shot the supermarket’s assistant manager who was standing nearby. Authorities said last week that an officer’s bullet killed Melyda Corado before a man took hostages inside the store on July 21. Moore had defended the officers’ use of deadly force as an attempt to stop what they feared could become a mass shooting. The police chief said Tuesday that he was concerned because the average number of rounds fired by officers during shootings had increased last year and the average number of officers involved in those shootings also increased. The police department will implement a new training program and is exploring how to equip officers with other non-lethal weapons, he said. In the newly released footage from officers’ body-worn cameras, police spotted a suspect, Guillermo Perez, 32, holding a large knife and a metal folding chair outside the Central Lutheran Church on June 16. They responded to the church that provides food and support for homeless people after a 911 call reported a man had stabbed his ex-girlfriend. She was taken to the hospital with injuries that were not life-threatening. “Drop the knife!” an officer repeatedly shouted at Perez, but he ignored the command. An officer fires several rounds from a bean bag shotgun — which fires a small sack with metal pellets — but Perez appears to use the folding chair to deflect them. Perez walks backward and approaches a woman, Elizabeth Tollison, who was standing nearby. He dropped the chair and put the knife to her throat. Witnesses told police that Perez moved the knife in a “sawing motion against her throat and cut her throat,” Cmdr. Alan Hamilton, who leads the unit that investigates police shootings, said in the video. Three of the officers then opened fire from their handguns, shooting 18 rounds total. Both Perez and Tollison were killed. Moore told reporters that hostages’ lives are a priority and recruits are generally taught to use a “precise head shot.” He said an investigation will look at whether the officers’ actions align with hostage training.